This set of three cushion covers come with warm and bright design that will create an elegant touch to your decoration. Each cushion cover features a double sided Sanganeri style block printing. Made with excellent quality Indian fabric with bright background and warm colored printing, these cushion covers will add an artistic atmosphere to your interior settings. There are two different style of design on these cushion covers, you can actually combine the two different styles or just use one design of your choice for the three cushion covers. That's why each cushion and cover is sold separately. These cushions are excellent option if you want to have a unique Indian style ethnic touch in your interior decoration but you're not too comfortable about using bright colored fabrics, like many other products made with Jaipur fabric. These cushion covers offer a more neutral color, so it's easier to match them up with your furniture and the rest of your interior decoration. The covers are easily removable and you can wash them using a washing machine with cold water. 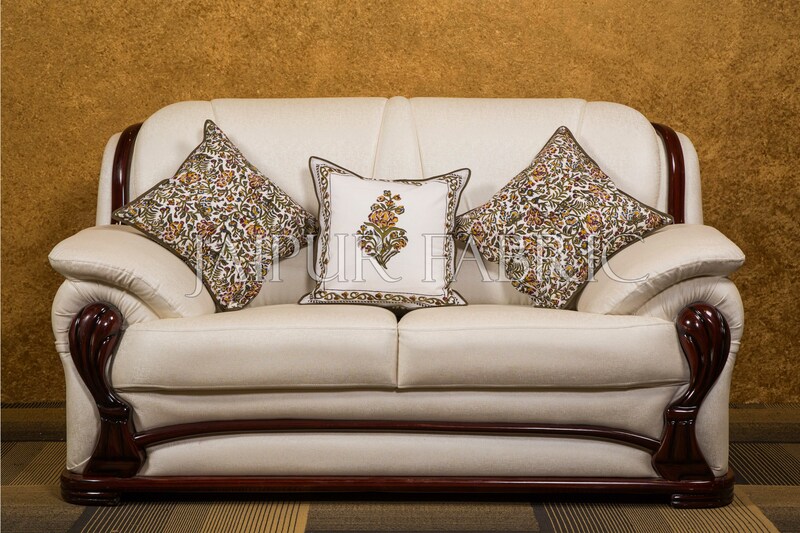 This easy maintenance feature is definitely an added value to these gorgeous cushion cover set. Sanganeri is a block print technique originating from Sanganer, a village located in the state of Rajasthan, to the south of Jaipur. This printing style already existed for more than 5 centuries and until today still plays an important role in the textile industry in India. The success of this block printing method in Sanganer has made people from other regions copy this technique, and today there are many other places in India that are also known for their block printing such as Jodhpur, Barmer, Akola, and Bagru. However, Sanganer is still known as the best place to get the best quality block printing because this is the place where this technique was introduced for the first time. Most Sanganeri printing comes with delicate patterns and warm colored designs. Sanganeri print has become a form of Indian art with great support from the royal families and rich traders since the beginning of its appearance. It has influenced Indian tradition and culture in their fundamental nature. A lot of Sanganeri print dyers came from Punjab and Sindh, they formed a community called the Chippa community. Usually the whole family including children is involve in the printing process, and this has been going on for many years. So most Sanganeriblock printing workers have actually trained to do the job since they are very young, no wonder why they have such excellent skills. There are various types of designs in Sanganeri print, especially after the block print technique spread to other regions. Each of these regions put their own distinct culture to the design, adding more characteristic to the fabric. However, most Sanganeri print are made with flower motifs. Some of the most common types of flower being used in the design are sunflower, narcissuses, and roses. Besides flowers, some other common patterns are fruits, folk scenes, and depicting various gods. Today Sanganeri printing has become widely popular amongst all age groups, especially women. Many designers are using Sanganeri printed fabrics in making traditional-contemporary dresses, and there is also a role of modern technology involved in the manufacturing process. By using technology, dyers could experiment by using unusual color combinations that are impossible to do with traditional techniques. However, traditional Sanganeri printing techniques are still used by so many manufacturers. Even though they cannot play with more color combinations, but the uniqueness of the fabrics created using traditional methods are irreplaceable. With the involvement of modern technology, it's also possible for manufacturers to experiment in designs. If previously such prints can only be found on kurtas or sarees, nowadays it can be applied to skirts, dresses, scarves, and many other types of apparel. With the introduction of Sanganeri print on various types of apparel, today Indian fashion has become more popular and not only known for its silks and chiffons. Many local designers and some international designers have started using Sanganeri printed fabrics to showcase Indian fabrics in international stores. One of the main reasons why many designers fell in love with Sanganeri is because it's light, easy to wear and formed, also very ideal for the summer heat. It is also probably the easiest print to maintain. You can wash it either manually with hand or using a washing machine. But still you cannot wash it too regularly because it will fade the color overtime.